Alignment determines the appearance and orientation of the edges of the paragraph: left-aligned text, right-aligned text, centered text, or justified text, which is aligned evenly along the left and right margins. For example, in a paragraph that is left-aligned (the most common alignment), the left edge of the paragraph is flush with the left margin. Vertical alignment determines the position of the text within a section of a document relative to the top and bottom margins, and is often used to create a cover page. On the Home tab, in the Paragraph group, click Align Left or Align Right . On the Home tab, in the Paragraph group, click Center . On the Layout or Page Layout tab, click the Dialog Box Launcher in the Page Setup group, and then click the Layout tab. On the Home tab, in the Paragraph group, click Justify . 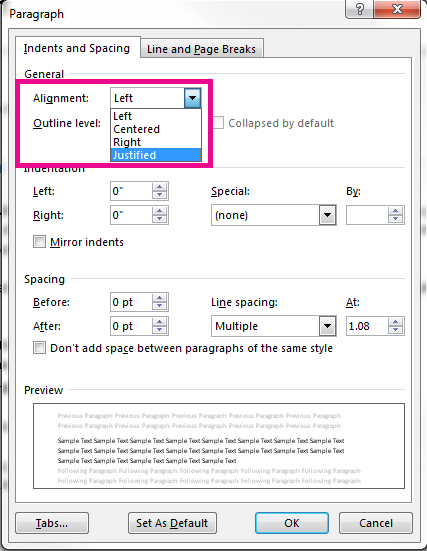 In the Paragraph group, click the Dialog Box Launcher , and select the Alignment drop-down menu to set your justified text. Click the cover page that you want. A cover page is always added to the beginning of the open document.